Superior Room with ensuite bathroom, spacious shower and seperate toilet. Aircon, tv, mini bar, outdour shower, balcony with views of the private garden. Wheelchair friendly. De Zeekoe Oudtshoorn offers a unique in the world opportunity to walk with Wild Meerkats (Meerkat adventures) and to be part of the shy 5 experience! De Zeekoe's unique charm & extraordinary activities attracts guests of a different kind. People from all walks of life visit this stylish lusern farm in search of a unique experience. Guests can choose between various Oudtshoorn Accommodation, ranging from stylish rooms to rustic waterfront chalets, either for a self catering stay, a stylish bed and breakfast or a farm holiday. 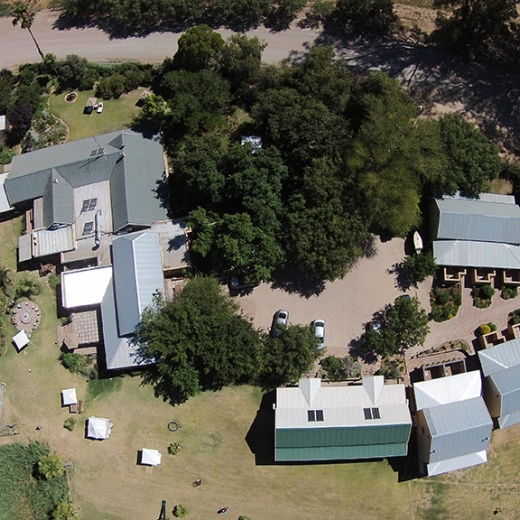 Our Little Karoo Accommodation is ideally situated to visit the famous "kknk" Klein Karoo National Arts festival. 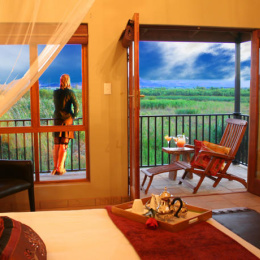 This hidden gem has spectacular views with 162 bird species and not the "big 5"
The idyllic setting indeed has something to offer for everyone – from the daring adventure-seekers to those who just yearn for a quiet getaway. The coastal town of Mossel Bay is a scenic 40 minute drive away and Knysna only 90 minutes. De Zeekoe is also conveniently situated half way between Cape Town and Port Elizabeth. De Zeekoe has all the “ingredients “for a great restaurant: a beautiful setting with an open deck; skirted by an expanse of lawn and the Olifants river. This beautiful setting is offset by background of natural karoo field and mountain views, letting you feel far from the buzz of the city; and... a restaurateur with a passion for food and good service, ensures an enormously satisfying gourmet experience. The Klein Karoo is renowned for its unique cuisine. Traditional ostrich, venison and appetising vegetarian dishes with a unique Karoo twist are just some of the plates of delicacies offered on De Zeekoe's impressive menu. De Zeekoe's delicious dinners are complimented by its comprehensive local wine list, supplied from our own wine cellar.